Very good collection of links. The same is true with govt union employees. Even if some one goes on permanent disability, we continue to pay them and we can not hire any one else and the work suffers. In New Jersey, we had asked GM employees who get paid but have no work to assemble in one place each day from 8:30 am toill 4:15 pm and use them as volunteers. They can not refuse to do any work we ask them to do as per their contract. Again, law differs from state to state. I have used some of them as volunteers in my program. AT&T also has a very powerful workers union. 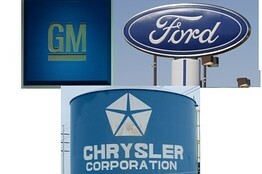 GM, Ford, and Chrysler are a national disgrace, but we still need to save them. – By Daniel Gross – Slate Magazine: The shrewd John Gapper makes the case in his Financial Times column, and hedge fund sharpie Bill Ackman seconds the motion. In the National Review, Jim Manzi makes the ideological case. Of course, they’re all correct. Allowing the listing Big Three to keel over would be a triumph of free markets. It would punish failure and invite new managers and investors to enter the field. I’m a big fan of creative destruction and its wondrous benefits. (I wrote a book about it.) But I also think the no-bailout folks are being too cavalier.